The biggest election in the world began this week with over 900 million people voting over the next 5 weeks to either renew the mandate they had given to PM Narendra Modi in 2014 or plunge the country into a coalition rule that has always been messy & incompetent. Now we wait until May 23 to find out who won. But we already know who won in this week’s election. Bibi Netanyahu won his election in a narrow victory, a victory that makes his tenure longer than that of Ben-Gurion, the founder of Israel. Ben-Gurion’s Israel had dreams of being a secular state and Ben-Gurion himself thought “the religious impulse would die out – that Zionism, the desire for Jewish sovereignty was the glue that bound his people together”. The quotes are from the article “The Age of Bibi” by George Friedman of Geopolitical Futures. Inclusive societies have a common vision. But Israeli society, “made up of Muslim Arabs, Christian Arabs, Druze, secular Jews, nationalist religious Jews, ultra-orthodox Jews, and a host of other smaller groups” does not have such a vision, writes Dr. Friedman. This stark & serious contrast is one reason there is increasing discordance between American Jews & Israeli Jews. This, especially the changing attitudes among younger American voters, was discussed at length in a Stratfor article titled Generational Trends in US – Israeli relationship. Politically speaking, this discordance between American Jews & Israeli Jews shows up in the popularity of President Trump who is reportedly the most popular man in Israel but not so much in the mainly “liberal” American Jewish community. But that may be changing. There has been disquiet about the direction of the Democrat party so far but what happened this week could be a Crossing the Rubicon moment. not just in New York but all over America. This is the week when Rep. Ilhan Omar turned from being a nutty but interesting isolated Congresswoman into a chilling vision of the future. 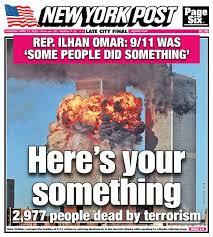 Her characterization “some people did something” to describe the 9/11 attack was frightening to many. And the absolute lack of any protest by the Democrat Party leadership was far more scary. In another scary clip, Omar suggested a moral equivalence between Al-Qaida-Hezbollah & the US Army. She actually wondered why the professor she described does not have the stiffened reaction to the names of the US Army that he did to Al-Qaida & Hezbollah. What is next? Will she demand trying US Army troops for human rights violation in Afghanistan or in other parts of the Middle East? Possibly the emergence of Rep. Ilhan Omar and her backers in the Democrat party might actually convince the American majority that America may not remain the America they have loved; that their children may not have the rights they had growing up & in adulthood. Societies do not like destabilizing changes, especially when they happen with such visible speed. Frankly, we don’t understand the silence of Joe Biden, Bernie Sanders about what Ilhan Omar said & keeps advocating. We understand they have to get to the final dance and getting there might require less than acceptable partners. But getting there besmirched with terrorism & religious hate filled garbage has never won the trophy for any one. PM Netanyahu won at least partly because he was the one leader who was committed to protecting Israelis from Hamas, Hezbollah & the Ayatollahs of Iran who want to destroy the “Zionist entity”. PM Modi may win a majority at least partly because of his military retaliation against terrorists inside NonPakistan. Now Rep. Ilhan Omar & her supporting cast in the Congress are scaring the American majority already perturbed by the specter of Nancy Pelosi & Chuck Schumer gang opening up America’s doors to an illegal immigrant invasion. So we wonder whether we will again see the silent majority swing towards President Trump just as they did in 2016. His tax cuts, his handling of the economy are pluses but what might actually drive the exodus from the Democrat party is the building conviction that President Trump might be the only one to save America from rule of Ilhan Omar, Rashida Tlaib & the illegal invasion.